The Cubix RPS Resolve 12 Win4U Model consists of a HostEngine 4U computer designed to run up to four GPUs, either GTX or Quadro Series GPUs, which are housed inside its chassis. 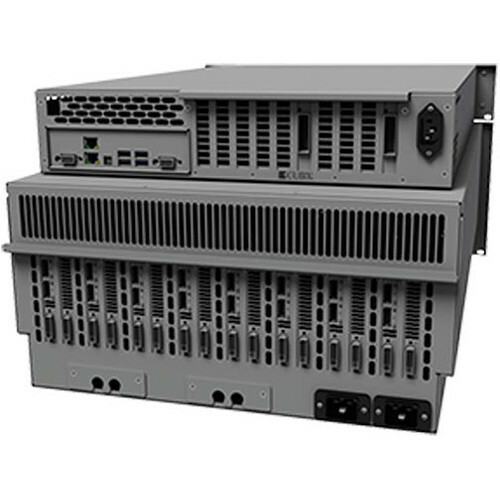 It can accept up to four double-wide GPUs and can be placed on a desktop or rackmounted. The system comes with 3+1 redundant power supply with a total power output of 3000W. The Win4U comes pre-installed with the Windows 8.1 Pro operating system. The system is powered by two Intel Xeon E5-2680v3 2.5 GHz processors and is equipped with AMD FirePro W2100 (GUI) graphic controller. For storing large amount of data, the system comes with 500GB SSD. In addition, it is also equipped with two NVDIA Quadro K5200 graphic cards and 32GB (4 x 8GB) DDR4 RAM. Note: Note: Each Customer/End User must add your own Blackmagic Design DaVinci Resolve 11 license key.